The Faculty Lounge: For Marketa Irglova, Once Is Not Enough. For Marketa Irglova, Once Is Not Enough. 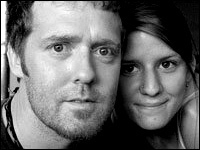 Glen Hansard and Marketa Irglova won the Oscar for Best Song tonight for Falling Slowly. After Hansard gave his thanks, Irglova started to speak as the music ran her down. This is pretty normal for the Academy Awards which seem to give particular audio space to the big money big winners. Once, the movie that won this award, was made for $100,000 and a relatively few people have seen it. (Count me among them.) For the next five or ten minutes, I wandered around my living room, cleaning up, feeling very irritated. Irglova should have been allowed to say something, I felt. I don't know why I really cared about this petty indignity...but I did. Then something I never expected, happened. Jon Stewart called Irglova back on stage to give her a chance for a brief thank you. So I'm left wondering: why? Was there a national email uproar? Was it the apparent sexism of only letting the man talk? Was it Irglova's eagerness to get onstage, followed by her silencing? Did the crowd boo during the break? Or did someone at Academyland take individual responsibility and correct what we might call in the legal biz, plain error? This event was a reminder to me that in any given moment, even very minor things can seem important. The Oscars are literally meaningless compared to the nightmare realities of American crime and criminal justice for example. But for that moment, I was sucked straight into my TV. Very disconcerting! I rather assumed it was because Stewart's joke after the initial acceptance speech ("That was so arrogant...") fell so flat that this was an obvious way to recapture the audience's sympathy and make clear that he'd only been joking. I heard that Colin Farrell asked that she be able to come back on to give her speech.